Dont be fooled by power lines. Were so used to them that they are literally part of the landscape. 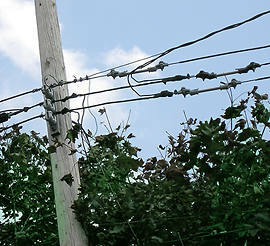 I had been under the impression that the only power lines that were of concern were those high tension power lines. You know, those big ugly ones that often run along interstate highways and near power stations. Not true. Even the garden-variety power line, the low wire you see in most neighborhoods, might have a higher than average or normal charge. The three-phase power line behind our house, set a mere six feet from our back bedroom wall, is the friendly-looking, telephone-pole looking thing, with the three equidistant wires suspended from it.
) are low enough in EMF readings. The good news is that the EMF levels reduce exponentially as you move away form the source. Prior to our correction, however, the EMF readings (read in mG- or milligauss units) were high, often high enough to create fields inside our house many times the safe level. See www.silencingthefields.com/page158.html for an explanation from Ed Leepers book, Silencing the Fields as to why our innocuously looking power line was potentially lethal. It depends on whom you ask. No government agency cares to set a safe level, because the utility companies would then have to do millions, maybe billions (Im not a mathematician) of dollars worth of remediation. So they wont go there. My understanding is that any reading approaching 2 mG (milligauss) is unsafe. Since our situation has been corrected, I get very unhappy when our readings get as high as 1mG. These links will provide you with information about safe levels of EMF exposure: www.safelevel.com and www.powerlinefacts.com. Our three-phase power line (photo above) had higher reading than the parking lot just adjacent to one of those ugly power stations near our local supermarket. Once we were aware of it, I took regular readings in our bedroom of anywhere from 2.5 to 6mG and even higher, while sleeping in a safer room each night. See My Story for details. My advice: get a Gaussmeter and check the readings in your home and workplace. More information about EMF Detectors is here. This site is not affiliated with any manufacturer nor do we get any monies for products mentioned.